This spacious ranch style home is located on a large lot with over 39 acres of land. Built in 2000, the home is made of both brick and wood. The home is situated as a single-family unit on a large rectangular lot. This beautiful home has plenty of room for owning horses, adding outdoor sporting equipment, or placing new buildings. Families will find room to roam, explore, and enjoy the peace and quiet away from the hustle and bustle of the busy city or loud neighbors. This gorgeous home has more than 2,200 square feet of living space with 2 1/2 bathrooms and 3 bedrooms. It has several nice features including a porch, an attic, hardwood and tile floors, and two patios; one covered and one open patio. For mornings in a hurry, the kitchen is equipped with a built-in dining area, but there is also a formal dining area for family gatherings, holidays, and special dinners. This luxurious home also has an attic, security lighting, and kitchen appliances including an oven, a dishwasher, pantry, and a garbage disposal. There are several features that make this home stand out and create an inviting atmosphere. The living room has a wood burning fireplace which is perfect for late night movies or curling up with a good book. The home has a workshop that gives owners plenty of room to work on projects and space to store extra items. It also comes equipped with a security system so that homeowners feel safe and secure. A two car garage with a side entrance into the home makes access easy and safe, especially during bad weather. A huge advantage for this home is the central air unit that will keep the whole home cool and consistent in hot temperatures. An open deck allows plenty of room for family gatherings outdoors or space to grill out. 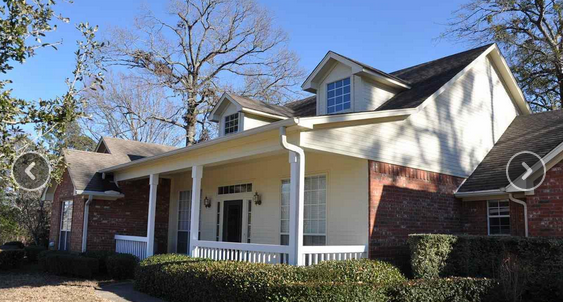 The spacious ranch home is located in the Cordova neighborhood which is in Rusk County, TX. There are many different cities located within a short drive including Tyler, Henderson, Overton, and Kilgore. Each city has multiple amenities including shopping, fine dining, movies, theater, historical museums, and sporting arenas. For instance, Overton has a city pool and several parks for stretching, exercising, and staying fit. Kilgore offers movie theaters such as Four Star Cinemas, the East Texas Oil Museum, and the Lonestar Speedway. Henderson has attractions such as Henderson Country Club, the Depot Museum, and several parks and cinemas. Tyler has the Texas Rose Horse Park, The Caldwell Zoo, and Fire Mountain Amusements for families to enjoy. The schools in the area are West Rusk schools and there is easy access to several colleges like The University of Texas at Tyler, Texas College, Kilgore College, and LeTourneau University. Each city near Cordova offers access to plenty of universities, colleges, and specialized educational training. Each school offers unique opportunities to study agriculture and other major fields. The data relating to real estate for sale on this website comes in part from the Internet Data Exchange (IDX) of the Greater Tyler Association of REALTORS® Multiple Listing Service. The IDX logo indicates listings of other real estate firms that are identified in the detailed listing information. This information is deemed reliable, but not guaranteed. The information being provided is for consumers' personal, non-commercial use and may not be used for any purpose other than to identify prospective properties consumers may be interested in purchasing. Data last updated 2019-04-23T17:28:44.587.